OFCOM are the broadcast regulators for TV and Radio. However, parts of their code of conduct are crucial in other fields of journalism. For instance, the written forum. The two most important sections of the code for journalists are Section 5 (Due impartiality and due accuracy) and Section 7 (fairness). All of section five is important for a journalist as each part of the section focuses on making news that is correct and that isn’t biased. This section also is extremely important as it reinforces the ethical and moral guidelines of a credible and truthful journalist. The points below highlight key rules. If significant mistakes are made in news it should normally be acknowledged and corrected on air or through the right means. Any personal interest of a reporter or presenter, which call into question the due impartiality of the news/information, must be made clear to the audience. The other import section is 7 which focuses on fairness. It talks about fairness to all people within organisations and those who are participating in a program. To sum up the section it helps the journalist to sustain a high credible, trustworthy and reliable profile. This helps the public to trust what your saying and helps to uphold your professionalism. The points below highlight key rules. This ensures that broadcasters avoid unjust or unfair treatments of an individual or organisation in a program. it may be fair to withhold all or some of the information where it is justified in the public’s interest or under other sections. An essay that will be worth 30% of marks – There are 7 topics with different subject matters to choose from. Reflections are required throughout the semester on sessions but focused on how it is important to us as the journalist and what we have taken away from the session. IPSO – regulates journalism press but is not a government body. Most newspapers uphold their views using IPSO code of conduct. What is meant by Ethics? Ethics is a system of moral principles. These play a role in everyday life. The death knock – when someone dies and a journalist knocks on their family’s door to as if they want to do a tribute piece. It needs to be approached sensitively. In a recent session, we learned the basics to what makes a newsworthy story and how we can set the tones for the stories at hand. We also had an introduction into how to write the first couple of paragraphs of a news story. I found this challenging however at the same time enjoyable. This is the type of things I needed to learn to help me to become a sports writer. The basic rules that are essentially for writing high professional standard introductions for print (Newspapers) are to make sure they are written in the format for that style of newspaper. Making sure the tone is right and matches the type of story that is being written. If it’s a serious story, make sure this is portrayed thoughts the words used. Also making sure it is short, snappy straight to the point by using the 5W, H techniques, I learnt that you don’t often see all of them within an introduction but it is best to get as much in. As I am doing a project that requires me to write for Hull Daily Mail ‘Your News supplement’ I need to use as many of the 5W’s, without giving to much away. This is so that it makes the reader more likely to read on after the first paragraph. Also I will also make sure that all spellings are correct and accurate as this is important and helps to keep that professional standard. For instance, spellings of places and names. Only using names if the person is well known in the public domain, not otherwise till further down the story. 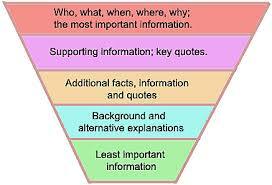 From having a news editor (Charlotte Richardson) as a client in my last course she was very specific about using the ‘Inverted Pyramid’ this means that the most newsworthy parts of a story should be situated at the top and the more irrelevant information further down the article/story. This means that the reader is more likely to be attracted into reading. Generally, people who read news stories read the first couple of paragraphs so by having the most important information at the top means there not missing out. In the image below it shows the structure that a news story should follow in order for it to be written in the correct way. At first I found it a bit confusing and difficult to get to grips with it, however, by having these skills will allow me to become a better practitioner of my work and to appear to be of that professional standard. It is also vital to make sure your story is of public interest or something that you believe is important for them to gain knowledge of. When doing my first news story for the Your news supplement, I found it really difficult in the sense that I promoted certain things and I should have done it in the ways that it didn’t promote. Newspaper stories need to be none biased. You shouldn’t give opinions. This was a really good learning curve for me, this means I will try and make sure I don’t make the same mistake twice. This was another session I missed so caught up with the tutor to find out about the task. He said that I needed to identify why social media verification is extremely important to me as a practitioner of journalism. Also how I can make sure something is true, accurate and put out into the public in a factual and professional way. I honestly believe that social media verification is extremely important and that you can’t take it lightly. When developing my skills as a journalist and media processional, I learned how you can’t always take things at face value, it is imperative to find out if something is factually true. If I publish something that hasn’t got any factual evidence then it can really damage my professional statue and reputation. In journalism you should follow the NUJ of the national union for journalist’s codes of conduct. It is to how and what you should do to be a good quality professional in this industry. People in this line of work (Journalists) have to maintain high professional profile. This means they have to follow good morals and principles of journalism. This will help journalists to retain and build a profile for themselves and with make them more credible and trustworthy. The NUJ code of conduct is a guide to whom journalists should take into account for instance, by following these guidelines will help to keep them safe whilst in the industry For instance, the guidelines are there so that they know boundaries and so they know certain rules and regulations. The NUJ is really basic common sense but put into writing. If a writer has good morals then they are sure to follow the codes. Holds confidentiality and protects identities of sources who give information in confidence. They should make sure that no material is made/ publicised that could lead to isolation/discrimination of an individual. For instance, age, race, gender etc. Social verification is crucial as an individual’s job is on the line. From learning that you can’t always trust the media especially social networking, finding out the false to the real is crucial. However, social networking can also open many doors, it’s a quick and fast way that I can discover breaking new stories and uses these newsworthy data pieces within my studies and line of work. As a journalist you always want to keep ahead of others and keep knowledge fresh. There are many ways I can make sure the information I find is accurate and true: for instance, contacting the source identifying the 5W’s and H, also see what else is happening in that field. I would also see what is trending, checking things on multiple of sources not just going on what one person has said.